Rent the main house (4 adults) or for an additional fee, add the private guest house next door (2 adults) to accommodate up to 6 adults. Our ancient village house, shown on maps from the 12th century, was beautifully restored in the Provencal manner by the architect, Christian Richer. Modern kitchen and bath fixtures have been carefully matched with raised-panel woodwork, wrought-iron hardware, terracotta tiles, white stucco walls, and large windows. Medieval details are matched with a touch of the Southwest USA. Each of the four floors in the main house is furnished with colorful French and Native American fabrics matched with a mix of antiques. As is typical with village houses, ours is very compact and vertical in nature. Rooms are bright and open but not large by US standards. Be prepared to go up and down the narrow, circular staircase several times each day. The front hall includes a coat closet and utility room. Up the narrow curving staircase takes you to a guest bedroom with built-in desk, twin beds (can be moved together for a queen size), good closet space and a separate tiled bath with combined shower/tub and a built-in clothes washer/dryer. Up another short flight of curving steps brings you to the living area, one side of which has windows that overlook the tiled rooftops of Seillans and beyond to L'Esterel mountains. This multifunction area includes a pillowed banquette, antique chairs, settee, dining area and a modest yet well provisioned kitchen. Large windows open wide to let in the sunlight and cool hillside breezes. Just a few steps off the main room is the master bedroom suite with a double bed, built-in closets, and a sitting area with a desk and bookcases filled with books and guides. The bedroom also includes a pumpkin-and-white ceramic-tiled bath with fluffy white towels, a skylight, and a large shower. A pocket door provides additional privacy between the master bedroom and the main living area. The roof terrace is reached via a set of handcrafted mahogany stair/steps. These are steep but surprisingly easy to adjust to. Up top you will discover a breathtaking view of the countryside below, swallows overhead, and tiled rooftops of the village. The terrace includes a table, chairs, sun umbrella and Provencal kitchen with BBQ grill, sink with running water, dishes, and pots of flowers. 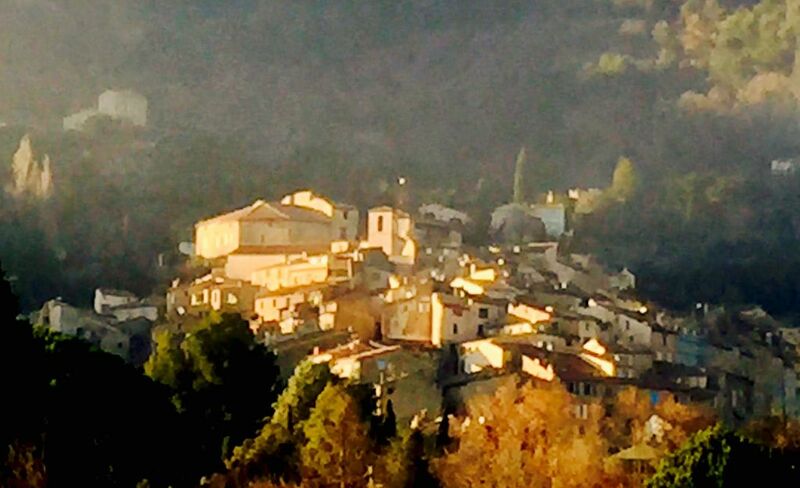 Seillans is a small, quiet medieval village ranked one of the most beautiful in France. You go there to get away. There are no streets inside the village. And so there are no vehicles. Cobblestone footpaths, protected by the historic trust, traverse the 300-house village. Here you can decrease your carbon footprint while on vacation because you can easily walk, not drive, from our house to local businesses and cafes. And you walk to our house from the parking areas provided along the village perimeter. About 100 yards/meters each way. A short walk down La Rue de la Boucherie brings you to the busiest part of the village where there is a small grocery store, flower shop, pizzeria, gift shop, day spa, bakery, post office, ATM machine, beauty salon and a newspaper/tabac shop. There are outdoor tables in the square at Placette de la Route where you can order food and drink from the cafe/bar Charlot or on the terrace down the street at the Maquis wine bar. Walk back up to Place du Thouron, find a table by the fountain, and enjoy a more substantial meal at La Gloire du Mon Pere or at Chez Hugo, two fine restaurants. And while Seillans has 4-5 restaurants, a world-class cooking school, a few shops, interesting art galleries (like The Orange Tree), and a small charming hotel, it is not a major tourist destination. There are no crowds here to impede a stroll to the boule grounds where you can order a glass of rose from the little bar, sit a moment, or take a look at Le Génie de la Bastille, a sculpture created by Max Ernst when he lived in Seillans with his wife, Dorothea Tanning. You can also order an aperitif under the plane trees shading the Hotel des Deux Rocs, enjoying the view of the Chateau, the 12th century Saracen's Gate, and Font d'Amont. Seillans may be quiet (at least when the church bells are not ringing) but it is far from isolated. Day trips can be planned along the Cote d'Azur, into the heart of Provence, or up into the Haut Var, the region just above Seillans. And then there are all those other intriguing perched villages where you can spend an afternoon visiting local mills that produce extra-virgin olive oils, watch as local artisans create stunning hand-blown glassware, shop for fresh foods and antiques at outdoor Marches, or spend time driving from vineyard to vineyard, for degustation, sampling the local Cote Provence wines right in Seillans at Chateau Selves or Val d’Iris. Other destinations within an hour's drive (depending on traffic conditions of course) range from an ancient abbey at Thoronet to the Mediterranean beaches, like those at Frejus, Cannes, St. Tropez, and Nice. And then, just think, you get to drive back to the peace and quiet of our private home in Seillans, just in time for dinner on the terrace. Rent one or both houses! Our property in Seillans includes the main house and a self-contained guest house right next door. Either home can be rented separately or rent them both as one package for larger groups. The two-floor guest house has a private balcony, full (small) kitchen, living area with fireplace, one bedroom (two twin beds), and one bath w shower. The guest house is attached to, and designed in the same style as the main house, but reached by a separate private entry. When rented together, the two houses comfortably accommodate six people. The rate for the main house and guest house TOGETHER is an additional 700 Euro / $850 USD (approx) per week over the main house rental. Or rent just the guest house. It's an inexpensive way to stay in the village of Seillans. Email for availability as the guest house rentals are not shown on the calendar. We decided that a 700-year-old village house in Seillans was much more interesting to own than stocks & bonds. Come see for yourself and enjoy the peace and quiet of life in a medieval village with wonderful restaurants, small shops, and art galleries all within the confines of this car-free perched village. Surrounded by forests and nestled on a hillside in the Var region, Seillans is a wonderful place to relax. This area of France is a combination of lovely beaches, red rock mountains, the ocean, inland lakes, the Alps, canyons, fascinating cities, medieval villages, and great food wherever you go. And these are just some of the reasons why we enjoy life here in the Var. We are fairly quiet so the atmosphere in Seillans is just perfect for us. It can get a little boisterous in August, but it will still seem quiet compared to the more touristy cities and villages in France. Beyond the holiday crowds in the heart of Provence, or along the Côte d'Azur, the historic perched villages of Seillans, Fayence, Mons, Bargemon, Callian and many others offer visitors a relaxed pace where you can unwind and enjoy life ... once you are off the French roads of course. These are just some of the reasons why we chose this place for our home away from home for six months each year. And we enjoy sharing the experiences of those who come to rent our home each summer, as they discover life in the south of France for themselves. Have you ever wanted to experience life in a renovated 700-year-old home? High up in a medieval perched village? Our home in Seillans has a long history of occupants ranging from farm animals to generations of families long gone. So if you enjoy being a part of history as much as we do, then learning more about the perfumerie up the hill, the artists Max Ernst & Dorothea Tanning, the old silk worm building, the Chateau, and the 11th century church around the corner (L'Eglise Saint Leger) then you might also enjoy staying in the village of Seillans and in the Var. There are wonderful hiking trails beginning in Seillans. You can swim in freshwater Lac St Cassein. There is even a brand new sports center for those who skateboard or mountain bike. And Seillans has a public swimming pool and tennis courts. Local art galleries dot the village and surrounding area which has been a haven for artists over the years. The light here is brilliant and you can see works from the masters in many places from the Picasso museum in Antibes to the Maeght Foundation in St Paul Vence. And if you like antiques as much as we do, there are weekly markets throughout the area ... from flea markets to serious antique events. But nothing surpasses the food. Much of it locally grown and sold in weekly markets, farmer's markets, and in local grocery stores. Add the local olive oils, wines, honey and bread to die for and you may want to get a house here yourself one day. If you prefer night life and the bustle of the city, you may want to rent closer to the coast in Cannes, Antibes or Nice. But you can always go there from our place, it's only a 45 minute drive. Panoramic views over the ancient tiled village rooftops to Fayence, St Paul en Foret and beyond to the ancient l'Esterel mountain range along the Mediterranean coast. Beautiful sunrises, swallows, and the church bells all add to the enjoyment of life up on the terrace. There is a house phone for free calls throughout France. Prepaid phone cards can be used for long distance, or you can use Skype via our wifi internet ADSL access line. No, just big windows and electric fans. Fluffy cotton sheets, pillows, blankets, duvets, and towels in both houses. There is a washer in both the main house and guest house. Only the main house has a dryer. There is also a clothes line in the main house and guest house. Yes but not to be used during the summer months. Free parking throughout the village with an average walk of 100 meters/yards to the house. WiFi, pronounced Wee Fee in France, is available to our guests. Only in the main house kitchen. Compact refrigerator w freezer in kitchen. Auto drip and espresso in main kitchen. Fully stocked with modern as well as vintage items. There is a full kitchen in both the main house and the guest house. Basic kitchen staples are provided and additional items will be there at your request. Antique table with space for 4-6 diners. Excellent selection of books to read. There is a fine stereo system and you can plug in your 3.5cm jack to listen to your iPod or other MP3 player. The guest house has a lovely balcony overlooking roses, hiacynth and bouganvillea with a view down to the ancient stones of the Placette Font Jordany. Outstanding views over the village and beyond. Perfect for private evening meals while watching swallows circle above. Terrace also has sink with running water, potted plants, sunshade umbrella, tables and chairs. Seasonal skiing in the Alps, about 2 hours away. We have had guests who brought their own portable walkers. But the old cobblestones, the steep inclines, and the stairs, are a challenge. Seillans has a public pool by the tennis courts. And there is another one nearby in Fayence. Hair dryer, French soap, iron and ironing board (in both houses), antiques, cookbooks, novels, travel books, maps, beach towels/picnic blankets, studio-size digital pipe organ in guest house, guitar in main house, small pets can be considered.